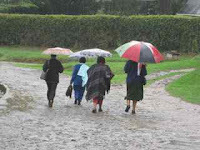 Kijabe for the first time in over 2 years has seen significant rain. 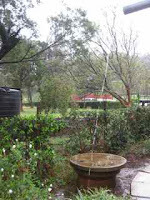 Over the past two weeks it has rained heavily for several hours every evening. Almost overnight as you can see from the pictures like a Garden of Eden everything has turned brilliant green. Flowers are blooming and crops are growing. Local Kenyans are planting again and expecting a decent harvest from their Shamba. Water tanks are full. Dry river beds now have flowing streams. We have water in our pipes and with decent pressure. It's good to have some diagnostic equipment, but not so good when the people using it don't quite understand some of the implications of their findings. Many "technicians" end-up with on the job training and sometimes certain concepts get overlooked. Today, a patient was sent for obstetrical ultrasound because the intern couldn't find a fetal heart beat at 42 weeks. After hearing the story, I decided to wander to ultrasound to see if the baby was still alive. As the tech was measuring fetal bones, I asked if she had already seen a heart rate. Her answer, "Yes." What I should've asked was, "What was the fetal heart rate?" After watching a few minutes and seeing no movement and very little amniotic fluid I asked to see the heart beat. When it was found it was 80 and the tech said, "Slow, just like before." Given that normal is greater than 120 and it seemed the heart rate may have been braycardic for a while I grabbed the patient and said, "She needs a C/S now." Thankfully the OR had a free room and within 15 minutes (which is nearly a miracle) a 4.0kg boy was born. While he has needed special care in the nursery he is alive and seems to be fairly neurologically intact. Praise God. Although I'm not an endodontist it seems like completing root canals is becoming my own dental speciality at Kijabe. My patients who are often members of the community here at Kijabe (pastors, nursing students, doctors, landscapers, shopkeepers) come when just a filling won't quite do. Regardless, were happy to help them out with needed endodontic treatment to get them out of pain. Some of you may know toothache pain (in particular a necrotic, irreversable pulpitis, or slowly dying nerve) is a terribly annoying discomfort. No one want to come for root canal or hear they need a root canal, but I make a few friends after the fact when they are out of pain. Furthermore, as the radiographs show from two patients from yesterday, I think we provide pretty good care. Thanks for the many prayers for the sale of our house in Akron. 16 months after listing, many negotiations, and the hassle of trying to get many documents sent/e-mailed from Africa, it is official, our house has sold and belongs to someone else. 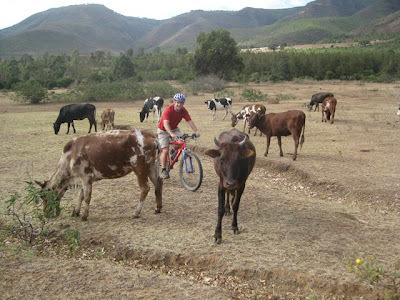 Cows are just one of the many obstacles when riding in Kenya. Others domesticated animals grazing the trails include sheep & goats (which easily move out of your way) and donkeys (stay clear of the back of these). More traditional African animals seen around Kijabe on the trails are dik dik, baboons, monkeys, and across the highway elephant (but I have yet to see these). As my foot entered my shoe I felt something cold and hard... maybe a rock I thought. But then it began to wiggle. "Ahhhh" I pulled out my foot and turned my shoe upside down. 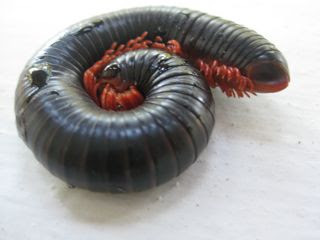 Out I shook this not so little (nearly 4 inches long and thicker than my thumb) black and orange centipede? I now know (as I have previously been told by Africans) you must shake out your shoes before you put them on. At least I did not find a snake in my shoe. "Word of our God Stands Forever"
The screams were heard at about 10:00 PM on a Friday night from outside our house. 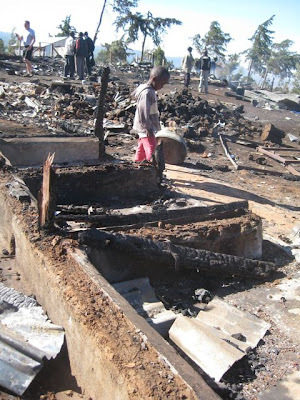 We soon found out a gas cooker had exploded in a timber built house just below Kijabe Hospital. It was a structure that housed 9 families; most of them hospital staff including one pregnant mother, a 2 week old baby, and many children. There is no fire department here, so the the hospital was immediately notified. A tractor hauling water from the hospital arrived much to late as all the homes were in flames. Thankfully everyone got out safely and there were no injuries or fatalities. The following day the staff and I at the dental clinic walked down to survey the remains. 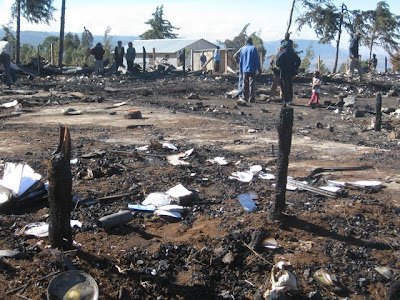 We saw family members still sifting through the ashes and smoke for personal items (In Kenya almost all important documents including birth certificates, land titles, money, marriage papers, diplomas are stored at home). They were all lost in the flames. I talked to a father who had lived there, "The tried to come with water, but it was too late. It all happened so fast. We lost everything. But God will provide." We prayed together as a staff for these families who had lost everything they owened. The Kijabe Hospital Chaplain has reminded us that we all need to help out these 9 families in need. It is easy to say, "He will help, or she will help, and if pass on the responsibility to others, no one will be helped." The dental staff has began filling a large action packer full of blankets, flour, soap, clothing, rice, utensils, plates, chai cups. Thanks to many of your donations directly to our project account through Samaritan's Purse we have made a monetary donation to the fire tragedy fund to help rebuild their houses. Lastly, I found this beautiful young Kenyan girl. She had found her Bible amongst the ashes. 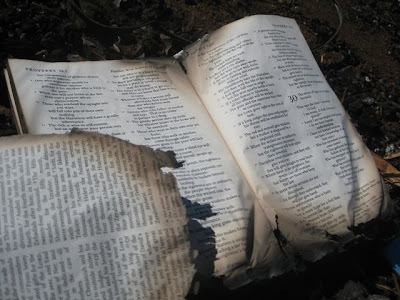 You can see in the picture above the pages of her Bible were crinkled, covered with ash, and burned around the edges; but the text is still readable. The fire took away her house and her belongings, but it could not take away her faith in Him. Our prayers and support are with these families as they recover. Addendum- Some have asked how can we help these families in need? Financial support can be directed to our Samaritan's Purse account #003548 and designate Friess/Fire Tragedy Fund and 100% of the donation will go directly to the families affected by the Fire. We enjoyed meeting our fellow post-residents from all over Africa. One couple has to purchase all the food they need for a year. Another family works as the only family on the mission compound. And while we shared our different experiences, it was clear that we also shared similar struggles. Struggles of isolation from family and friends, working in a different culture, and trying to manage the overwhelming work loads. Together we were able to talk about how we each coped with these things. We also just enjoyed the fellowship of playing together! 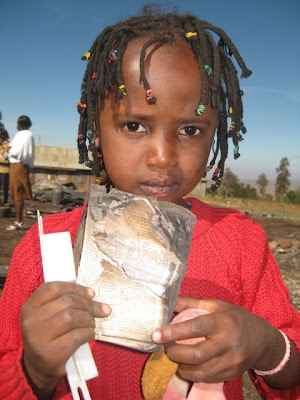 We're grateful Samaritan's Purse provided this time for renewal and are back at Kijabe almost ready to return to work. 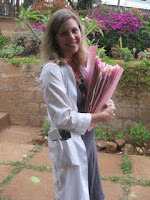 Pictured from left to right include (Dr. Hawk, Pediatrics Kijabe Hospital, Kenya - Drs. 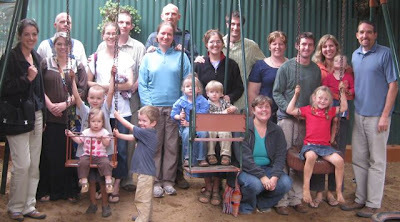 Gary & Leanne Finke, Pediatrics & Internal Medicine, Kijabe Hospital, Kenya - Dr. Tompkins & Family, Family Practice, Mukinge Hospital, Zambia - Dr Hoffman & Eric Hoffman, Ophthamology, Gabon - Dr. McGill & Family, Internal Medicine, Galmi Hospital, Niger - Dr. Morad (kneeling), OB/GYN, Kijabe Hospital, Kenya - Dr. Christina Francis, OB/GYN, Kapsowar Hospital, Kenya - Dr. Malin Friess (Dentistry) and Dr. Sara Cichowski (Ob/GYN) & family, Kijabe Hospital, Kenya- Scott Reichenbach- Boone, NC, Director of World Medical Mission's Post-Residency Program. 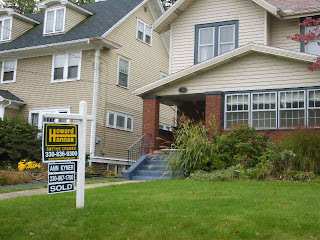 For the past two months we have been in negotiation with a buyer for our house in Akron, Ohio. It has been on the market for 16 months. We thought we were nearing a final agreement when surprise hit. We knew our old two-story wooden garage had always been a weak point in our house. The garage door never worked, the structure was listing to the left, and had mold growing throughout the panelling. According to the buyer's loan requirements the house simply could not be sold without the garage being demolished and cleared. As we began to receive quotes via e-mail for the cost of a demolition of a two story garage the prices were so expensive. What were we to do and how could we try to manage this situation on the other side of the planet? We contacted our church in Akron Westminster Presbyterian Church and said,"We need help." Within just a few days a work team had been established, notice went out to request volunteers at the church, a dumpster had been rented at a discounted price, a min-excavator was available for hauling of debris and concrete. Saturday morning several volunteers from WPC arrived early in the morning with sledgehammers and able hands to "Demolish for God's Glory." We were told the garage was demolished and cleared in less than 3 hours. We are grateful and thankful to all the members of WPC who donated their time, muscles, and equipment to bring down our old garage. It seems to exemplify perhaps one aspect of the purpose of the church: to love and care for members of its congregation. Thank-you WPC. It's always strange trying to change sleeping, eating and awake habits by 10 hours. But I'm thankful our family gets to spend next week together at a retreat with our mission organization Samaritan's Purse. Hopefully by the end of the week we'll all be sleeping through the night again. I recognize that probably only a gynecologist could get excited reading that a young adolescent is getting periods, but it was encouraging to know that the surgery was successful. I attribute a lot of that to the wisdom God provided through the power of prayer. Sara and Meredith arrived safely in Nairobi last night. We are thrilled to have them back in Kenya. Meredith has been telling me all about her fishing adventure in America, "Daddy, I go on Papa's boat and got the Ling Cod." Sara and Meredith are currently in the air on their way back to Kenya and we can't wait to see them! We have missed them greatly and are ready to have them home. Amelia's teacher told me the other day that she had asked Amelia what we have been having for dinner since Mom has been gone. 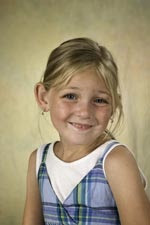 Amelia told her teacher, "Well sometime me and Daddy have cereal for dinner, and some time we don't have dinner at all!" I did take some exception to that remark as our standby meal has been hotdogs in the toaster oven, ketchup, carrot sticks, gatorade to drink, and boreos for desert. Sara and Amelia are expected to arrive this evening. We pray they arrive Hakuna Shieda (no problems). After living in Kenya for nearly 11 months it is easy to forget you live in Africa. Amelia goes to a Western style missionary school. We have Wasungu neighbors. We often eat traditional American foods like pizza, hamburgers, and peanut butter and jelly sandwiches. And finally, most people around speak english Yesterday I remembered, "Oh yes we are still in Africa." As I came home from lunch I heard Nancy our helper scream as she exited our front door. She was holding Mocha's sleeping blanket in the air and had a broom in the other hand. As she pulled out his blanket out crawled this snake. 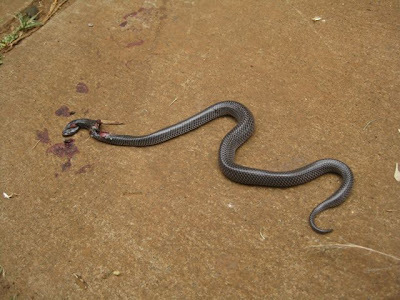 Before I could do anything the gardener next door smashed the snake's head with a shovel. 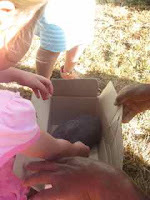 It continued to squirm for several minutes and of course Amelia and her friends were quite amused as they continued to aggravate the dying snake by poking it with a snick until it would twist. Oh, I thought no big deal must just be some ordinary snake. 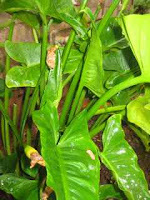 Why did the gardener destroy it so quickly? But wait, we are in Africa home to some of the most dangerous snakes alive including the puff adder (strikes incredibly fast and holds it victim), black mamba (its venom is a potent cardio and neurotoxin and can kill in as little as 30 minutes), gaboon viper (has the longest fangs and highest venom yield (1000 mm) of any snake), and the eqyptian cobra (preys on rats and chickens). I imagine this was most likely a non-venomous snake. But if anyone out there can identify the name of this snake it would calm all our nerves, including our poor dog Mocha. I had the privledge of sharing with 1st Reformed Church of Oak Harbor this morning. And thought perhaps others might like to read what I shared, so below is the meditation. For some reason the words to this old hymn written during the civil war keeps coming into my mind as I work at Kijabe Hospital, Kenya as an OB/GYN. I usually only remember the first verse and find great comfort knowing God is leading me as I see each patient and treat many problems I have only read about, but as I reflected on what to say this morning I felt an urgency to read the rest of the hymn and so this is a meditation based on He Leadth Me. Because the fact is that this God that leads our family loves us all dearly. God has called us and brought us to Kenya. Sometimes that means living without running water or electricity. Other days it means staying awake many hours to care for patients. It means being away from family and friends that we love. But also it means that God is leading Muslim, Somalian patients to Kijabe hospital. Imagine, we get to work in one of the most developed mission hospitals, there’s a school on premises for our children, and God is bringing 25% of our patients from a completely un-reached people group from a place I would never want to live. Can you exclaim with the hymnist what a blessed thought…God leads us. Or sing with David in Psalm 23: He leads me beside quiet waters, even though I walk through the valley of the shadow of death, I fear no evil for You are with me? It’s profound: God leads us. So the question really is, “Are you willing to be led?” I don’t know if God is leading you to or away from, into, through, beyond, around or near. As a family we are also not sure where God is leading us in 1 year… maybe into career missions, maybe back to the States, maybe to another country or further education, but we are confident God will lead and that IS a comforting thought. A moment in the eyes of a 6 year-old girl. "Daddy I went to check on my bunnies and Flower is moving but Lucy is just laying there but I'm not sure if she is alive because her eyes are open." I followed Amelia to the bunny cage and indeed Lucy was dead and stiff and lying on her back. Of course the tears began to flow from Amelia when I told her. "Daddy I don't know how this happened. I fed him every day. Maybe he needed to see a veterinarian. Daddy, this is the worstest day ever!" 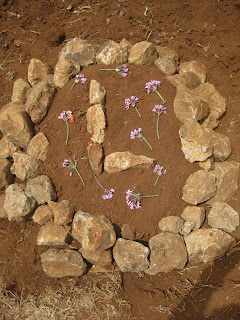 We buried Lucy in the garden so Amelia will see the grave every day on the way to school. She lined the grave with rocks and made the letter "L" in the middle. I said whatever words I could for the bunny rabbit. "Lucy you were a good bunny. You lived about 6 weeks here with us at Kijabe. You always ate the carrots we fed you. You never scratched. We will miss you." But just minutes after we buried the bunny. Amelia's tears all stopped. She was ready to play at a friend's house and has quickly moved on. Amelia wants to get another bunny, maybe a bigger stronger one this time. I think we can manage as Lucy cost 100 Ksh (about 120 cents). 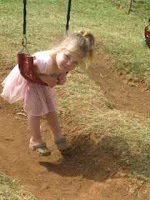 Jane was fearful and in denial about her condition several months ago when she came to Kijabe. 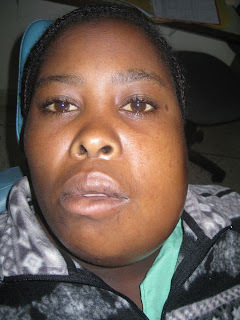 The swelling was present for 3 years and was hard to touch (intrabony swelling of the mandible). After clinically examining the size and extent of her swelling in her lower jaw and radiographic examination she seemed to have a dentigerous cyst. 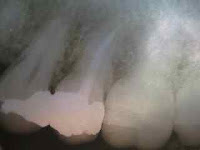 Dentigerous cysts are odontogenic cysts associated with the crown of an impacted tooth. 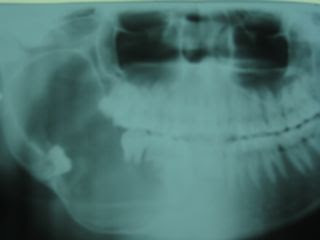 From the radiograph you can see how the radiopacity it closely associate with the right third molar displaced to the inferior border of the mandible. Treatment requires surgery to enucliate the cyst wall, drainage of the cyst cavity, and eventual decompression of the mandible. 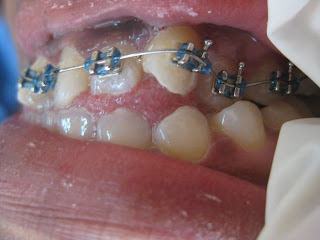 Prognosis for this surgery is very good with full recovery of function and aesthetics. We didn't see Jane for several months and it was unknown whether she was understandably fearful of the surgery or had not yet raised sufficient funds. She finally reemerged and we treated her in theatre with a general surgeon. After reflecting the gingival tissue and opening up the mandible into the lesion we were quite surprised. The lesion was full of blood and fibrous tissue instead of straw color cyst fluid as we had expected. The wall of lesion did not dissect smoothly off the margins of the mandible like a cyst lining but came apart in pieces. Furthermore the inside of her jaw continued to bleed forcing us to pack the inside of her mandible with 5 4x4 gauzes and leave the wound exposed. Jane recovered quickly. Unfortunately her biopsy came back positive for Ameloblastoma (a more aggressive pathology). 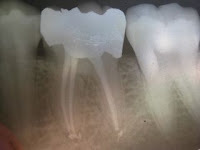 In retrospect examining the x-ray more carefully shows resorption of the 1st and 2nd molar root tips (perhaps indicating a more aggressive pathology) which might have led us to approach this differently. Her surgery although perhaps arresting lesion is non-definitive and she has high probability or reoccurence. Jane will require further more aggressive resection of her mandible. We have seen her once since, and hope she will agree to further treatment. 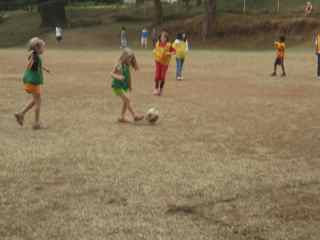 When time for soccer sign-up at school was announced to Amelia she told her 1st grade teacher Mrs. Kinzer, "Absolutely not!" 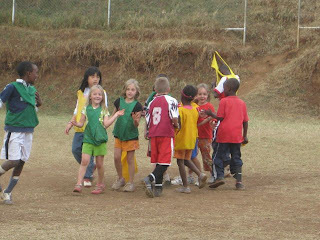 But at the time of the first game Amelia quickly realized that on the Kijabe compound essentially all of the kids were playing soccer and nobody was around to play with. "Would you like to go see what Soccer is all about and go up to school and watch the game?" I asked. Reluctantly Amelia agreed and we walked up to the field. Before long being a spectator was not nearly sufficient and Amelia put on a Green Penny and entered the field. (It was a proud moment for Dad as I have always enjoyed soccer tremendously.) There she went pony tails bouncing, running up and down the field, finding her way into the swarm of players. She even contacted the ball once inadvertently as it richocheted off her shin. Meredith and Sara and I cheered,"Go Amelia!" She stopped, found our glance, smiled and took after the swarm of players surrounding the ball again. It was fun for Amelia until she was accidentally bumped by a third grade boy (soccer is mixed gender and mixed grade to account for the small number of kids) to the ground. Her arm was scraped and she began to cry. The rest of the game was spent in Mom's lap and to make matters worse they lost 6-0 and the other coach brought cookies for their team and Amelia's coach didn't bring any treats. Playing organized semi-contact sports does not come natural for Amelia and I believe really takes a lot of courage for her. I expected that she would be done for the rest of season. But the next week to my surprise, Amelia said, "Dad I think I'll try soccer again." She has continued to play..always keeping a comfortably safe distance from the ball. One of the joys of transitioning to Kijabe Dental Clinic has been the facilities and added staff available. At Kijabe Dental Clinic we have 6 dental assistants, 4 community oral health officers, 3 laboratory technicians along with 6 functional dental chairs. 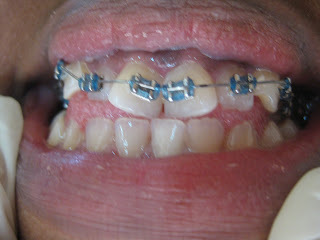 The oral health officers are able to triage the majority of our urgent need patients and complete simple extractions. The assistants are excellent with taking x-rays, sterilizing instruments, providing cleanings, and scaling teeth. These were all duties that previously I was trying to preform all on my own often not successfully. This available room and auxiliary staff has been a tremendous help and opens many opportunities to provide the higher level care for which I was trained. Some of the opportunities include teaching and creating a restorative curriculum for our oral health officers, daily morning devotions with the dental staff, and myself catching up on literature reading. We also have the time to go beyond treating emergent needs but also elective and aesthetic needs as well. As many of you know or may even experienced themselves as a child having crooked, bucked, or twisted teeth can affect self esteem and normal social development. Nancy is my first orthodontic patients. She will be a challenging case as she is bilaterally class III, severe open bite, blocked out canines, over crowded anteriors, prognathic mandible, and 22 years of age. We will learn as we go and let this heat activated nickel-titanium wire go to work. I'm so grateful that Meredith and I were able to come for the wedding of Daniel and Laura. Meredith was also able to meet her new cousin Josiah who's similar in age. Meredith has been calling my Dad ,"Prince papa, the king" today and wanted to wake-up Nana this morning to cuddle with her. She's enjoyed the attention from all the family and we're having a great time (although missing Malin and Amelia). For the past 3 months Amelia has been talking about wanting to go horseback riding (some special bond exists with little girls and horses that I have never understood). 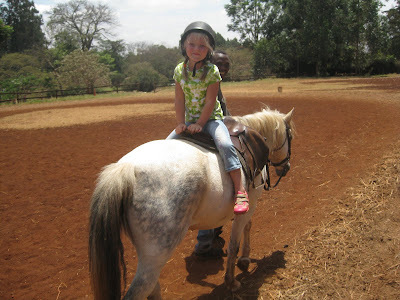 We talked about a donkey ride (much cheaper) here at Kijabe, but Amelia was not to keen on that idea. I did not even know if horses existed in Kenya. 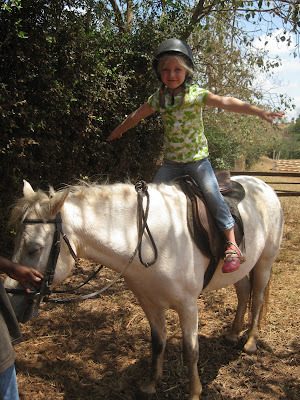 Due to Kenya's English Colonization we found a nearby stable with reasonable prices for English style riding lessons. We planned for the ride as a special treat when Mom & Meredith were back home for the wedding. After a couple wrong turns (directions are very difficult to follow here as most roads have no name) we found the stable. Amelia picked out her white stallion named Hedgehog. Her lesson included around the world, trotting, up down, and balance techniques. It is said that if you asked people at church if they became a Christian through a sermon a few would raise their hands. If they became a Christian by a book a few would raise their hands. If you became a Christian by a message on the radio or TV even fewer would raise their hands. But if you asked them did you become a Christian when you heard someone tell their story of how God transforms and then how this person took a personal interest in your life, almost all would raise their hands. She's not more than 5 feet tall and 100 lbs. With glasses and a large grin she never misses work or devotions in the morning. She has worked in the dental lab for the past 12 years. It was her day to tell her story. She reluctantly began with her mouth behind her Bible. "My childhood is full of memories. Some good some bad. I am the seventh of ten kids. My Mom loved us so much. My Dad...." tears begin, "I don't know if I can continue...My Dad was a drunkard. And I believe you do pay for your sins. He now only has months to live as the Spirit (Alcohol) has destroyed his liver. He use to beat the kids and my Mom when he would come home at night. He was a politician in our area. The other men did the same thing to their families. They had a lot of power and no one tried to stop them. I was a bad little girl. I had no joy, no ambitions. I said I would never marry. I never would let a man do that to me again. But after coming to Kijabe and having devotions, I met people who cared, people who prayed. I met God and he transformed me. He is everything to me. He is my joy, my comfort, my security. I began to sing again like I have always loved to do. I met a man that truly loves me. We pray together. We are best friends and we can share anything. We married and have two children that we love so much. I am blessed to work at Kijabe Hospital because here people have a genuine heart. They care about each other. I admire Esther in the Bible. She helped so many people despite her circumstances. I have so many favorite parts of the Bible it is hard to pick just one. But, I am lifted up by the end of Psalm 138.
your love, O LORD, endures forever..
My Dad is still a drunkard along with three of my brothers But God has given me the strength to forgive him. I believe God can transform his life as well. 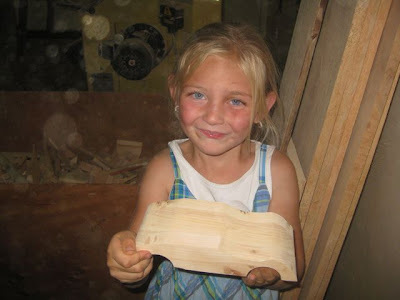 Amelia & I have kept busy in the wood shop here at Kijabe making her first pine wood derby car. She wants to make a unicorn car but in a race car shape. She has enjoyed drawing the shape and helping with the "sanders and cutters." Her car will be more advanced than mine when I was a kid carved with dull pocketknife. Race day is in a couple weeks. Sara and Meredith arrived safely in Oak Harbor, Washington at 3 PM yesterday after what we calculated was about 35 hours of traveling from door to door. Sara said Meredith was a good girl although the last four hours of the flight from Amsterdam got a little long.